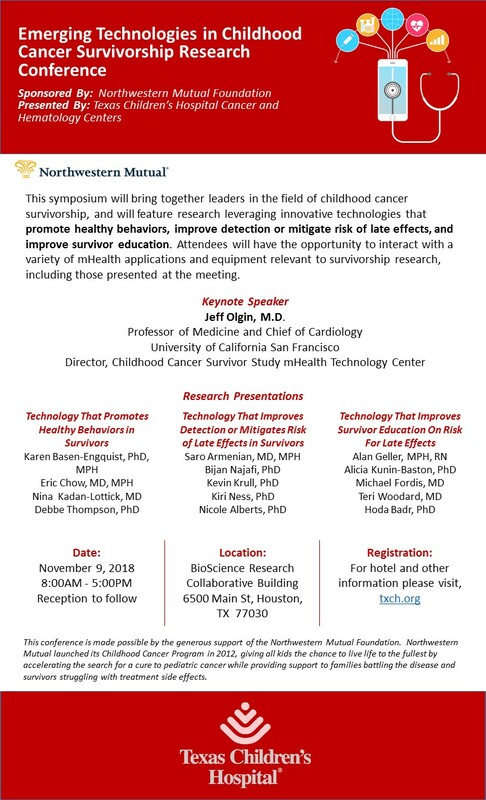 This symposium will bring together leaders in the field of childhood cancer survivorship, and will feature moderated research presentations, an expert panel discussion, and an opportunity to interact with a variety of mHealth applications and equipment relevant to survivorship research. Abstract presentations will be given by leading investigators conducting local and national survivorship research that utilizes mobile health and other innovative technologies. We expect this symposium to foster meaningful research collaborations and the development of new protocols that leverage this technology to improve the detection and treatment of late effects related to therapeutic exposures in survivors of childhood cancer. This conference is made possible by the generous support of the Northwestern Mutual Foundation. Northwestern Mutual launched its Childhood Cancer Program in 2012, giving all kids the chance to live life to the fullest by accelerating the search for a cure to pediatric cancer while providing support to families battling the disease and survivors struggling with treatment side effects. Group rates available at the Hilton Houston Plaza/Medical Center hotel.